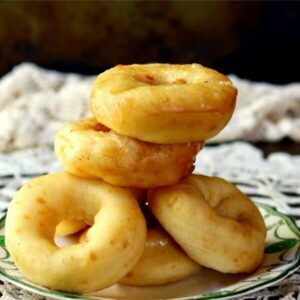 If you’re looking for a basic homemade donut recipe for glazed yeast donuts you’ve found it! This recipe is plain and just perfect for making glazed donuts, chocolate covered donuts, powdered donuts, or whatever topping you decide to use. 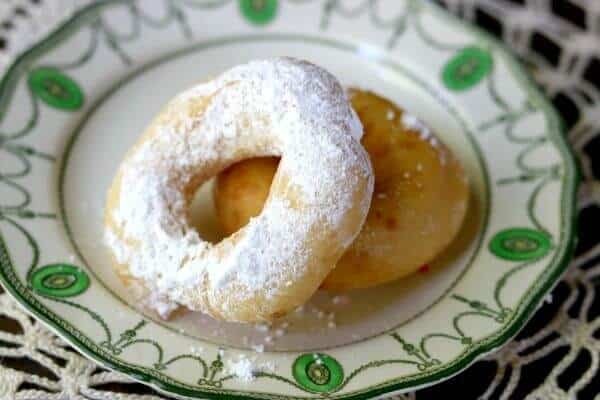 Donuts aren’t difficult to make and with this recipe and these tips you’ll be ready to turn your kitchen into a donut shop in no time. I was always afraid to make donuts from scratch. First of all, I was afraid of deep frying and second of all donuts happen to be available on nearly every major street corner in my town. What was the point? It wasn’t until I had been collecting vintage cookbooks for awhile that I decided (read that “got the nerve”) to try a homemade donut recipe. The first time I dropped a donut in hot peanut oil I knew what the point was. It’s magic watching them cook and float to the top and it’s pure delight biting into one that’s only had seconds to cool down. Making donuts made me feel like part of a long line of home cooks that had made donuts over the decades, including Almanzo Wilder’s mama in Farmer Boy. Best of all I learned that fresh, homemade donuts are delicious whether they’re yeast donuts like these or cake donuts. Homemade yeast donuts will make fluffy donuts while cake donuts are quicker. Make sure the dough is well chilled so it’s not too sticky. Always cut the dough straight down with even pressure – don’t twist the cutter. Peanut oil is best for frying if no one has allergies. The oil should be completely up to temperature. 365F to 375F is best. Only fry a few at a time or the oil will cool down too much. 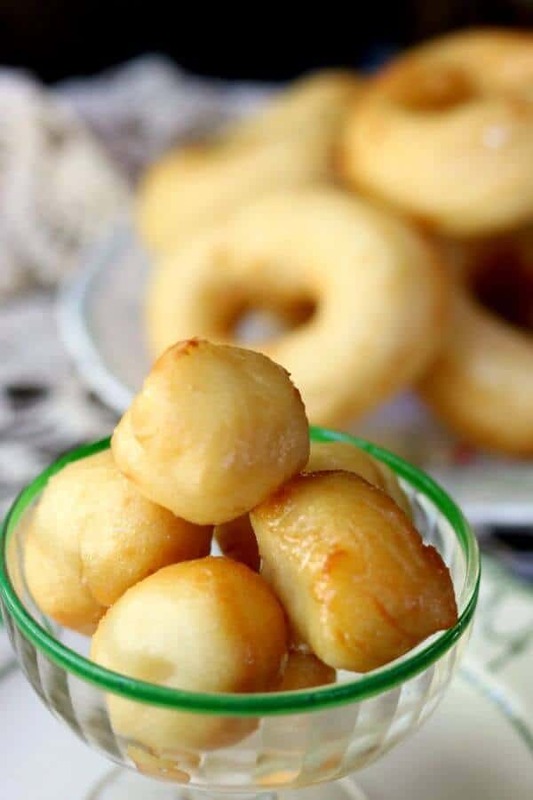 Flip the donuts when they rise to the top and are light golden underneath. 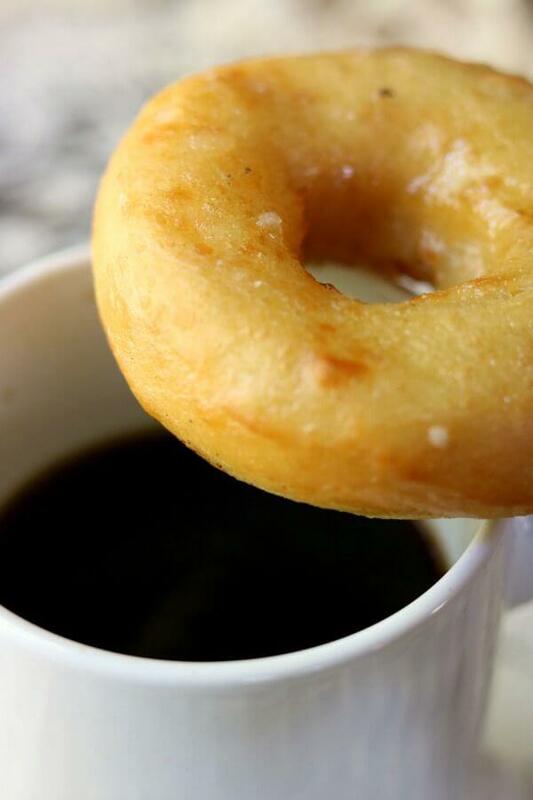 Keep the dough as soft as possible for light donuts. Refrigerate it as needed to keep it from being too sticky. Drain the donuts into the fryer for a few minutes before removing them to absorbent paper. If you’re freezing the donuts don’t glaze them first. An electric deep fryer makes frying SO much easier, y’all. Seriously – get one. This homemade donut recipe with it’s sweet, sticky glaze makes a dozen (or more) light, delicious donuts. If you don’t want to use the glaze you can roll them in powdered sugar or cinnamon sugar. 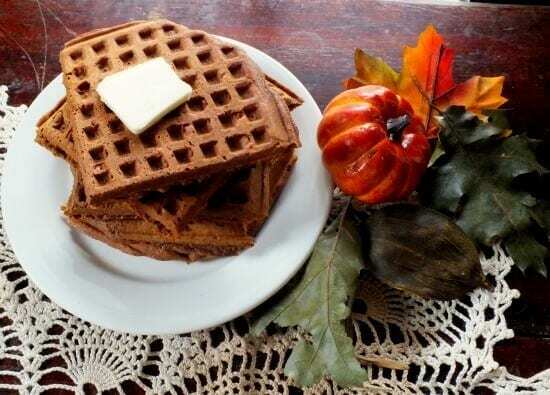 If you like this recipe (and I know you will) please consider giving it 5 stars. 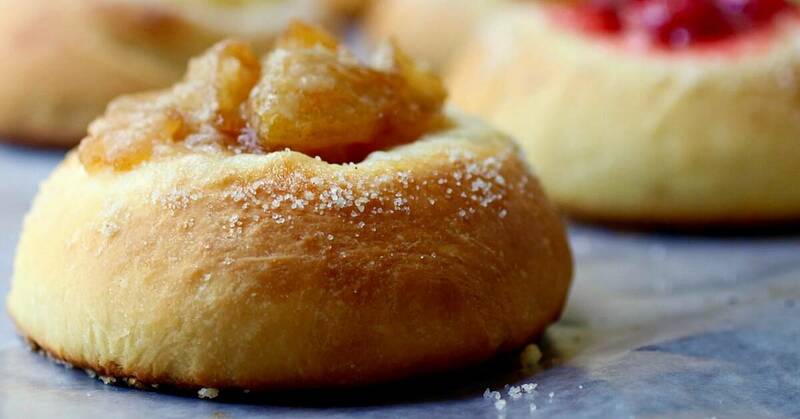 Yeast donuts are a lot easier to make than you may think. 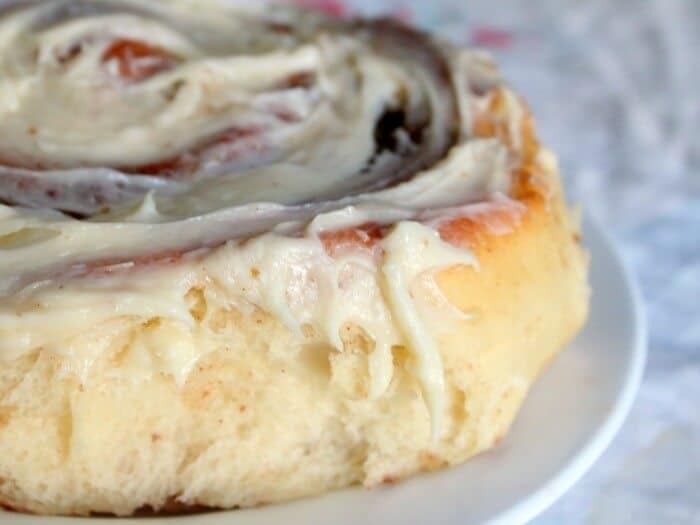 These rise light and fluffy with just a hint of lemon flavor and a sweet glaze. Fill a deep fryer will the peanut oil. Add ginger, yeast, water, and a tablespoon of sugar together in a stand mixer and set aside for 10 minutes, or until it gets bubbly and foamy. Add in the milk, remaining sugar, eggs, melted butter, lemon zest, and vanilla. Blend well and 2 cups of the flour. Turn the stand mixer on medium speed for 2 minutes, then add in the salt and as much flour as needed to make a soft, sticky dough. Brush the top of the dough with oil, cover the bowl with a towel and let rise in a warm spot until double - about an hour. Working with half the dough at a time, roll it to 1/2 inch thick on a well floured surface. Dip the donut cutter in flour and cut the donuts. Preheat the deep fryer to 370F. Place the donuts on a parchment covered cookie sheet and set aside to rise for 30 minutes while the oil preheats. Fry the donuts on each side for about a minute and a half. Remove from oil with a slotted spoon and hold over the fryer to drain off excess oil. 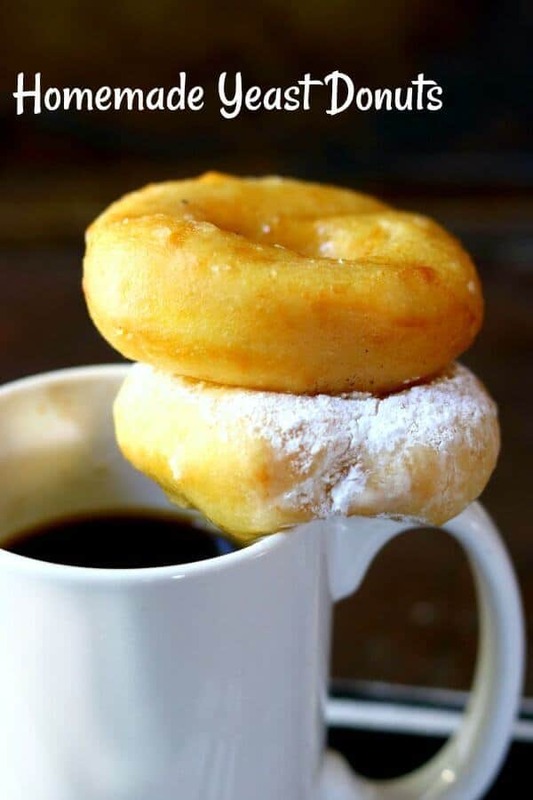 Place on a couple of layers of paper towel or a brown paper grocery sack until all the donuts are fried. Mix the powdered sugar, water, vanilla, and corn syrup in a small saucepan. Bring to a boil and boil hard for 2 tp 3 minutes. Instead of a slotted spoon, have you ever tried using simple wooden chopsticks to turn and retrieve the frying donuts? Due to our Chinese food habit, we always have about 40 or so accumulating in the silverware drawer. Works like a charm. Save your slotted spoon to pull the donut holes. I also rack donuts to drain them. Keeps that delicious, soft crunch and stops the residual heat from steaming the undersides into mush. Also, a tiny correction: add a tablespoon of sugar to the yeast mixture–not an additional tablespoon of yeast. Nice collection of recipes! Thanks for putting them together for us.